Here at Eastnor Pottery, process is king! It’s all about the journey and we greatly value and enjoy observing how our customers and workshop participants engage with the clay and their relationship with environment and individuals around them. That said, we oversee some pretty inspiring and sophisticated end products too! 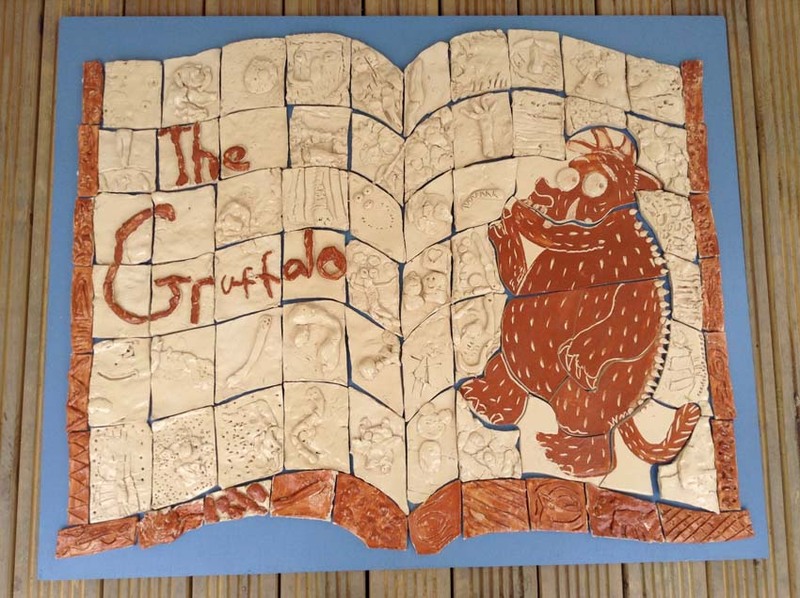 Check out these ‘book’ tile panels inspired by children’s literature we co-created with Meadows first School in Bromsgrove. We spent x2 industrious days working with the entire school, each child producing a single tile. The tiles have been assembled onto boards and will adorn the front of the school for community and visitors alike to admire when they visit the school. 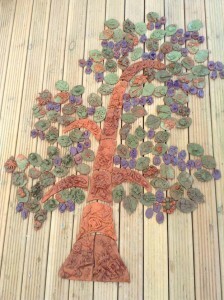 A similar project with an equally satisfying outcome was the Damson Tree tile panel made with Damson Wood First School in Solihull. This project was initiated to celebrate the schools 50th birthday and the resulting ceramic masterpiece made by the children will hang in the reception hall. Meadows First for book tile panels! All the tiles have been created and are currently drying out ready for their bisque and glaze firing. Once they have emerged from the kiln we’ll mount them onto boards and get them photographed and up on the blog. http://eastnorpottery.co.uk/wp-content/uploads/2019/03/eastnor_pottery_header_2019-3.png 0 0 admin http://eastnorpottery.co.uk/wp-content/uploads/2019/03/eastnor_pottery_header_2019-3.png admin2017-03-03 20:20:312017-03-03 20:20:31Meadows First for book tile panels! 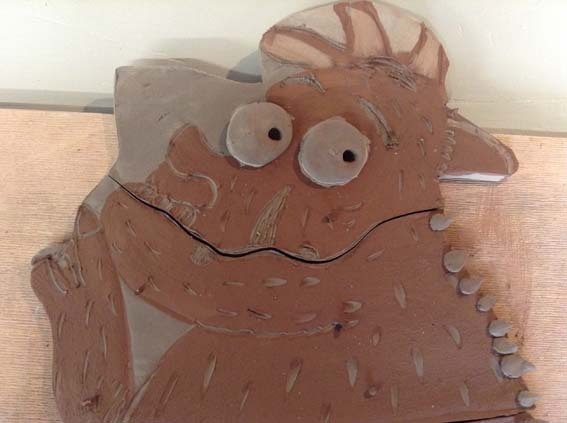 We are delighted to be working in partnership with Project Alleycat and Alderman Knight Special School in Tewkesbury to produce a fabulous ceramic art work. A giant tile panel in the shape of the Cheshire Cat will be created by students at the school and will adorn the wall in Warders Alley in the town. If you don’t know, Tewkesbury is famed for its many historic alley ways connecting the main streets. 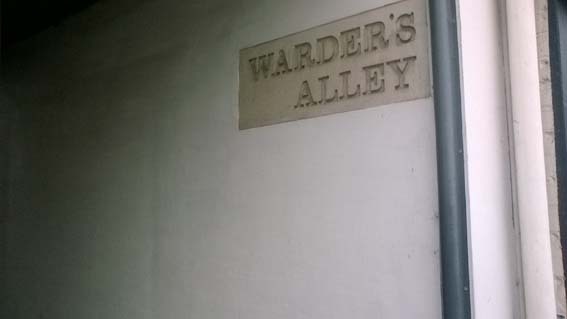 Warder’s alley runs from High St by M & Co. The front was rebuilt in the 1970’s in concrete. It is not an attractive site, and has problems with puddles and no lighting – perfect to be livened up with an eye catching ceramic wall mural. During the next couple of months, Sarah will be visiting Alderman Knight to work with groups of pupils. The students will also get the opportunity to visit Eastnor Pottery to work on the design. 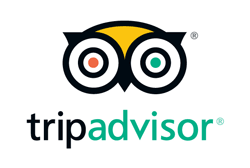 The scheme is being generously funded by the Leonard Cheshire Disability Trust. 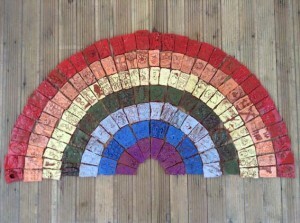 We are chuffed to bits with this fantastic rainbow collaborative tile panel made with all the children at St Mary’s Primary School, Fownhope, Herefordshire. 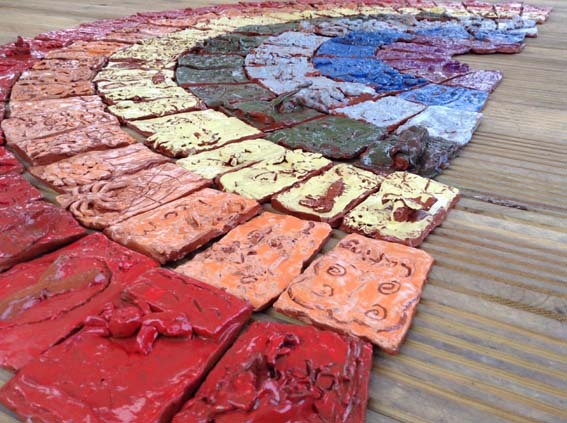 Each child created an individual tile representing one of the School’s values with each year group responsible for a different colour of the rainbow. The finished panel will be hung in the school hall for everybody to admire and as a constant reminder of what can be achieved through everybody working together.